Going into a public place is hardly ever a positive experience where germs are concerned. There are certain public items that people avoid at all costs like public restrooms and public drinking fountains. These are known to be the home of millions of germs. Bringing a young infant with their delicate immune system out into public areas is a task that many parents dread. A parent is quick to cover their child when someone coughs. What many parents do not always think about as much is the secondary locations for germs. Those areas that other people touch, then you are now touching or putting your child there. One of these areas are shopping carts. On one hand, you can always carry around a bottle of disinfectant to constantly wipe down the shopping seat before placing your child inside, or you can use a shopping cart cover to completely cover the area so that your child can touch and chew the cart without the fear of unknown germs. A shopping cart cover is a piece of cloth sewed to fit over the front end of the shopping cart where your child sits. There are many reasons that bringing this addition along with you on shopping trips is not just recommended, but also somewhat of a necessity if you would like to provide protection from public germs. By far, the number one reason to have a shopping cart cover is to protect your child from germs. First, think of everything that touches a shopping cart. There is, of course, people’s hands filled with who knows what germs they brought with them. These hands are all over the handle and side of the cart. Secondly, there are the items being purchased. If you are at a grocery store, there is raw meat that could be leaking its juices along with salmonella and E. coli all over the cart. There are also other non-food items leaving dangerous residue behind on the cart. If you have had your child for a few months now, you are probably well aware of your child’s habit of putting everything in their mouth. If they are not putting the item in their mouth, they are touching it then putting their hands in their mouth. That means that all those germs and residue left on the car and handle will eventually make their way into your child’s mouth. It doesn’t help that the handle that so many strangers had their hands on is right there in front of your child as a handy chew toy. A shopping cart cover protects your child from being in contact with anything on the cart. A secondary reason for shopping cart covers is for the added comfort. Some of you may remember sitting through high school on those uncomfortable cheap plastic chairs. Just imagine how much more uncomfortable those plastic or metal shopping cart seats must be for your little one! Not all covers offer padding, but if comfort is a big reason for purchasing a cover, then double check how much padding is offered before assuming the cover comes with the padding. The great part about shopping cart covers is that their uses are not limited to shopping carts. Many shopping cart covers cross over to high chair covers as well. When you go out to a restaurant, the restaurant high chairs are not much better than those carts where germs are concerned. Someone else’s child was sitting there, spitting up, having accidents, and who knows what else before you. Throwing on a seat cover will help ensure that whatever germs the past inhibitors of the seat had will not be passed on to your own child. Seat covers can have uses beyond just shopping carts and high chairs. Those are the two main uses as they are both common public items that are of similar shape: a seat with two leg holes. Some companies have developed seat covers that are even more versatile and can stretch over any seat, carrier, or even act as a cover for nursing. These covers, while they work, are not always as universal or have all the necessary safety features that shopping cart covers need. Shopping cart covers may be very simply made, but the addition of certain features or lack thereof can make a world of difference for your shopping experience. Here are some common shopping cart cover features to look for when considering which cover to purchase. Since a shopping cart cover is meant to keep an area sanitary for your child, it would make sense for the cover itself to be easy to keep sanitary. Look for a shopping cover that is easy to clean. It should not only be easy to clean but should be able to be cleaned thoroughly. This means that there should be minimal small nooks and folds of the fabric where food or dirt can get trapped. The cover should also be machine washable so that you do not have to worry about hand washing the cover on top of all your other chores for the week. Along with being easy to clean, the cover should also be waterproof. This does not so much protect your child as protect the area they are sitting on. If your child does make a mess, being waterproof will help contain the mess to the cover so that you do not need to spend any extra time cleaning up after removing your child from their cart. The waterproofing is also very important if the cover will be used for high chairs as well because then you will be dealing with food and drink spills. A seat cover will be traveling along with the baby whenever you go out in public because you never know when you may need to sit your child down in a public seating area. As a result, it is one more item to try and fit in that already over-packed diaper bag. The more compact the cover is, the easier it will be to travel with. If the cover comes with a small storage bag, then your life will be so much easier as you do not have to worry about the cover becoming unraveled in the diaper bag and losing other diaper bag items amid the folds of the cover. A second feature that will make your life easier would be extra cushioning. This does not make your life easier directly, but rather it makes your child happier and more comfortable which in turn makes the entire shopping ordeal easier. Padding is great for making your child more comfortable and lending some extra support, especially if they have just begun sitting up on their own. The downside of the padding is that the more padding there is, the less compactly the cover will fold. Another great feature for keeping your child happy during your shopping trip would be attachment areas for toys. This way, your child can remain entertained during the trip and you do not need to worry about them throwing their toys or pacifier on the ground as they can be attached directly to the cover. Some covers go a step further and even offer an area for the parent’s phone for either storage or to play a video for your child to watch while shopping. A shopping cart cover should not just be easy to use, it should also work well. This may not seem like a huge issue since, honestly, how can a large piece of cloth not work? Well, there is a little more to cart covers that should be considered. The first item would be your child’s safety. 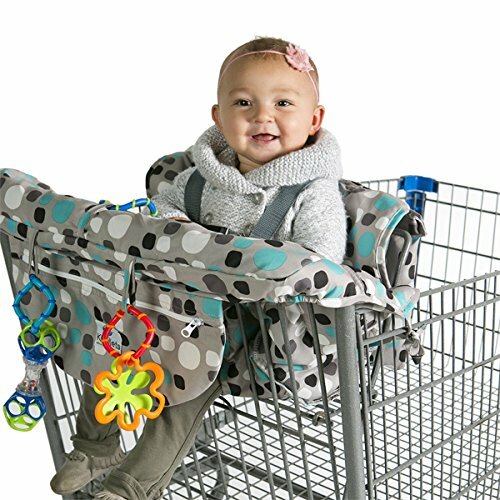 Most shopping cart seats will have straps to keep your child safely in the cart. High chairs also have these straps. When a cover is added, those straps are covered up. The cover itself should have their own straps to keep your child in the cart or high chair. Another type of straps to consider are the straps that then hold the cover to the cart. A little elastic will hold the cover to a point, but a little bit of wiggling from your child can easily detach the elastic and allow them to escape. A cover should have some sort of strap to attach to carts. The straps should be universal enough to attach to most any cart design. When you are attaching the cover to the cart, you will most likely also be holding your little one in your other arm. As a result, the cover should be fairly easy to attach with just one hand. Elastic and Velcro are two lifesavers when it comes to easy attachments. String ties and tough buckles are not the easiest to fiddle with while also balancing a baby. The straps are not the only part of the cover that needs to be universal. The entire cover itself needs to be able to fit on most all carts. If you shop at regular grocery stores, most covers will fit without an issue. The issue arises when you shop as some department stores or warehouse-type stores that have larger carts. Some of these carts are larger as they are built for larger items or bulk shopping. Some stores even offer double seated shopping carts. If you frequent any of those types of stores, finding a larger cover will be necessary. Shopping carts are very dangerous for infants and kids alike without the proper safety steps. According to Parents.com, the U.S. does not even have safety standards for shopping carts. This is why there are thousands of reported accidents involving shopping carts each year. When your child is a newborn, there are two main ways to carry your child when shopping. You can either baby wear your child using a sling or other item, or you can carry them in a child carrier. When you have your child in the child carrier, you will most likely want to set the carrier in the cart. A carrier should never be balanced on the rims of a shopping cart as it can be bumped off the cart by people walking past or by the bumps of the cart itself. Your child’s own movements can wiggle the carrier off the cart. Balancing the carrier on the handles is not any safer. Some stores have special carrier attachments on the front of the cart that allow you to secure the carrier. Approach these with caution as you never know how often these attachments are checked for security. If you have to bring a carrier, the safest place for the carrier is inside the cart. This will limit the space for groceries. This is why it is best to either baby wear, or have a second person to push the cart so your child can be carried in their carrier or pushed in a stroller. When your child is about 6 months, they will start to develop the appropriate muscles needed to sit on their own. It is at this time they can start using the child seats in the shopping car. The safest straps a child could have is the 5-point harness. These harnesses protect your child from sliding forward because of a crotch strap, wiggling out because of a waist strap, and standing up because of shoulder straps. Unfortunately, almost all shopping carts have just a waist strap, if even that. As a result, a close eye should be kept on your child as it is very easy for them to wiggle right out of the seat and fall out of the cart. If a second person is available, having your child pushed in a stroller separately is far safer than using the infant seats in the cart. Your child will eventually outgrow the seats. There will be an awkward period of time where they will be too big for the seat but may be young enough to still get tired easily. It is during this period of time many parents let their children sit inside the cart itself. If your child sits calmly down in the cart, they can remain safe. While this is not the safest place for your child to be, it is still doable in a pinch. If your children need the ride, be sure to emphasize your children’s need to remain seated. A child who stands up can easily tip over a cart and hurt themselves as well as anyone else around. In addition, if they move around they may affect the cart’s movements. This can cause the cart to run into displays or other people. If your children are seated, double check that they are at a secure point in the cart and the cart is still stable and will not tip. Some stores have provided much safer options for your children in the forms of various different types of children carts. One common type of child carts is low profile child riders with small baskets for groceries. These are usually a plastic car or animal where your child sits inside of. They are much wider and larger as well as being built for children. As a result, the chances of the cart tipping with your child inside is much slimmer than a regular cart. If your child does happen to wiggle out or tip the cart, they are closer to the ground so the fall will cause much less damage. Another option, though not as common, are small carts. These do not allow your child to sit down, or keep them close by. These are separate carts that are small enough for young children to push themselves. These are great for that age where they no longer fit in the infant seat but are too tired to walk. Being able to push their own cart will give them something to lean on to help preserve their energy as well as keep them occupied so they are less likely to feel tired when shopping. The Infantino compact cart cover is a comfortably soft, padded cover for both shopping carts of most sizes as well as high chairs. The cover comes in three different colors and patterns. The cover is easy to take with you on your outings as it folds up into a small bag with a handle that can either be carried as is or stored in a diaper bag. The cover has plenty of elastic to fit over most carts and high chairs. It also attaches directly to the shopping cart seat. A waist strap will help keep your little one securely fastened during your shopping outing. The cover has enough padding to provide a little extra comfort without making the seat bulky and difficult to travel with. There is one teether attachment for your little one. A second empty loop is available for a toy of your choice to be attached. In addition, there is a sippy cup strap to keep the sippy cup from falling out of the cover. The back of the cover has large pockets for additional storage. The entire cover is machine washable. The cover can fold up into a travel bag. The cover has padding for extra comfort. The cover fits most carts, even the larger warehouse store carts. There are hooks for toys and other items. Because the cover fits on most carts, it is also very large causing it to move around a lot. The material is very thin so the seams can come apart easier. The Infantino compact cart cover is one of the few cart covers that will fit on nearly any shopping cart you use. This versatility also makes it large with quite a bit of extra material which your child can use to wiggle around in the seat more. 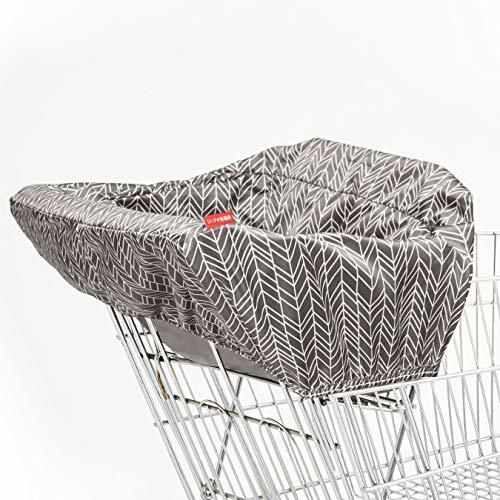 The Lumiere baby shopping cart cover for baby and toddler is like a fitted sheet and can fit over nearly any cart. The elastic also makes the cover versatile for both carts and high chairs. There is extra padding so your little one is comfortable in the cart or high chair. The entire cover folds up neatly into a little trendy pouch for easy storage and portability between uses. The cover is very quick and easy to attach. There are no complicated ties or belts to deal with. The cover works mainly like a fitted sheet. It can be stretched over the seating area of the cart. The sides then connect by folding over the edge of the cart and reattaching using Velcro. There is additional Velcro padding around the crotch bar of the cart to prevent your child’s legs from rubbing. The seat of the cover has a safety belt. The cover also has two short loops for teething toys or pacifiers. A clear pocket is located on the front of the cover for holding your phone. You can use it to either read your grocery list or play a video for your little one. An additional bottle strap can be attached or removed. This strap will keep your little one from throwing their sippy cup or bottle on the ground while shopping. The entire seat is made of polyester so it is easy to wipe down while using. When you are done using the cover, it can be thrown in the washing machine. On the back of the cover, there is a storage pocket for additional items. The cover uses Velcro and elastic to make using it easy and possible with just one hand. The cover is able to be wiped down while using. There are loops for teething toys and a bottle. There is a clear pouch for a phone. The cover fits most carts, even the large carts at warehouse stores. This is one of the more expensive cart cover options. There is very little padding. The material is thin and rips easily. This is a more expensive cart cover option but has some great features to make up for the price. One of the best parts is how easy it is to attach to the cart. It is so easy, you could probably do it with just one hand as there are no complicated buckles or tie strings. There is very little padding, but that also makes this a very compact cover when it comes time to packing it up. Though, with the higher price, there should have been better quality fabric used as the fabric of this cover rips fairly easy. 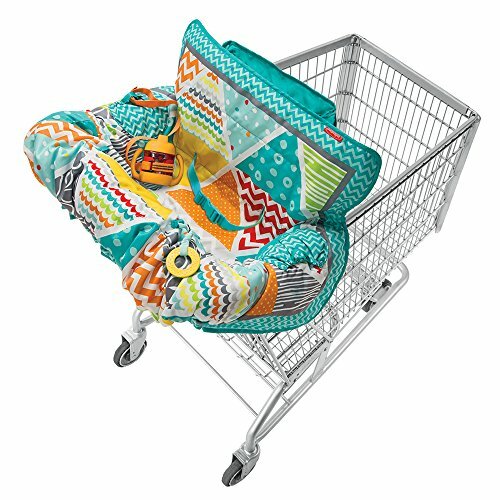 The Kiddlets grocery shopping cart baby seat cover is one of the safer covers for your shopping cart. It not only has some extra padding it also has a full harness for your little one. While most covers have the waist strap, Kiddlet goes a step further and provides shoulder straps to help keep your child from standing up in the seat. The cover itself is versatile enough to fit both carts and high chairs. It is a smaller cover and is not recommended to use at warehouse stores or other places that have larger carts. The cover attaches through an elastic front. There is then a strap that wraps around the back. The harness is attached directly to the cart as well. Side string ties are available to secure the remainder of the cover. The cover itself has just a little bit of padding. It is not enough to protect your little one from the sharp edges of the cart. The cover has three rings for toys or other items to attach to the cover. A large front pocket provides storage space for your personal items. The entire cover is made of polyester which is easy to wipe down. It can also be machine washed between uses. The cover folds up into a small tote. This cover offers shoulder straps in addition to a waist strap. There are key rings for toys and other items. There is a large storage compartment. The cover uses string ties, which cannot be done one-handed. There is very little padding on the cover. The cover does not fit very many carts, especially not the larger carts. The Kiddlets cover is another more affordable cover. Unfortunately, it is also a lesser quality cover than some of the other similarly priced covers. The main complaint of this cover is the lack of padding which makes the seat uncomfortable for infants. One benefit of this cover is the shoulder straps which do provide slightly better protection than many of the other covers with just a waist strap. The Leachco Prop ‘R Shopper body fit shopping cart cover is not just a cover but also padded support for your little one. You should not use the infant cart seats until your child is able to sit up on their own. That being said, this specific cover provides the necessary support to help your little one sit up during those first wobbly weeks of sitting. The cover attaches to the cart snuggly with the help of Velcro. A waistband is then attached to the cart itself as well for extra security for your little one. Your little one is nestled in the seat between two adjustable pillows. These pillows can be removed as your child grows older and doesn’t need the support. That being said, they do make the seat so comfortable, many children still keep the pillows even when they don’t need the support. 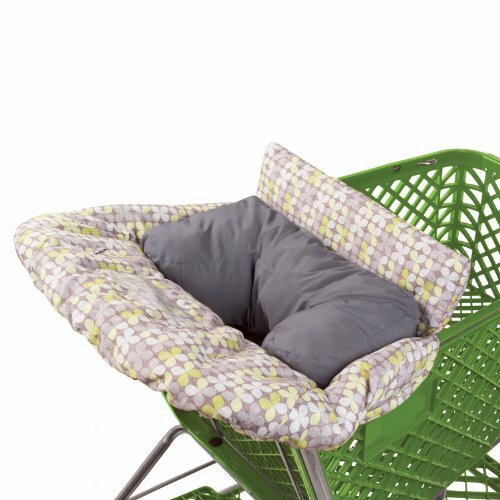 The cover can be used in high chairs as well, but in order to fit in a high chair, the pillows will need to be removed. The cover has two fabric straps for toys or other items for your little one. The back of the cover has two separate pockets for storing additional items for your child. When you need to transport the cover, it can be folded up into a compact tote. The entire cover can be machine washed, but the pillows cannot be machine washed. The cover is made out of 65% polyester so you are able to have spot cleaning between machine washings. The padding is both supportive and more comfortable than most covers. The cover has Velcro so it is easier to set up. There are extra storage pockets on the back of the cover. There are straps for toys and other items. This is one of the most expensive cart covers available. This is a bulkier cart cover. The pillows cannot be machine washed. The cover does not fit on larger carts like are found in warehouse stores. This cover will turn a regular shopping trip into a luxury cruise for your little one. If comfort is your main concern, then the extra cost will be worth the investment. This is a high-quality cover that offers safety, comfort, and many of the extra features that will make shopping easier. The main downfall is that you will be limited to using the cover on regular carts, as it does not fit on the larger carts of warehouse stores. 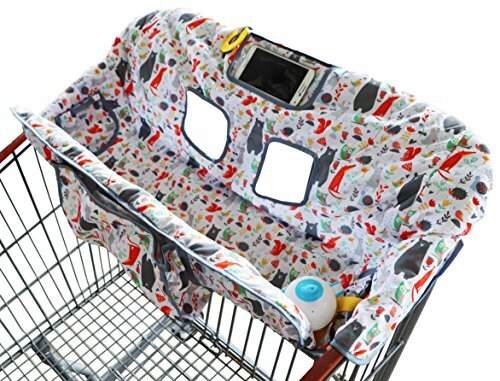 Suessie’s shopping cart cover for baby or toddler is a simple cover with the added bonus of a see-through phone pouch. This phone pouch allows you to place your phone inside with the screen facing your child. This way they can watch a movie or some other entertainment while you shop. The cover attaches to the cart with both elastic and Velcro. The entire cover is rather large and does not fit snuggly. This does allow the cover to be more flexible when it comes to sizes of carts that it fits on. It can fit in high chairs as well, though again it is rather bulky when used with high chairs. Many high chairs do not match up with the Velcro locations of the cover for attaching to the seat. The cover does have a waist belt. The cover has a storage compartment on the back of the cover for additional items. There are two loops where you can attach pacifiers or toys. There is also one attached teether already in place. There is a strap made just for your child’s bottle or sippy cup so they will not lose the cup during your shopping trip. When you are finished with the cover, it can be folded up into a compact pouch for storage. The cover is made from polyester so that it can easily be wiped down between uses. It can also be machine washed. There is a phone case for storing your phone where your child can watch movies. There are plenty of loops for toys and a sippy cup. The cover fits most carts, even the larger carts at warehouse stores. The straps of the cover do not line up with many restaurant high chairs. The cover is poorly made, and the seams tend to come apart after minimal use. The Suessie’s cover offers many great features. Its unique phone case is one great feature that many parents will appreciate, especially those who go on long shopping trips where two or three teether toys will not keep their child entertained. While the features on the cover are handy, the cover itself is very cheaply made and has a tendency to come apart after only a short time of use. EN Babies waterproof 2-in-1 baby shopping cart cover and high chair cover is another lightweight option with minimal padding for easier storage and transportation. This is one of the few covers that is completely waterproof. Any mess made by your little one while in the cover will be easy to wrap up and contain. You also will not need to worry about any liquids spilled on your child’s seat leaking through to their clean clothes. This cover attaches to carts with elastic edges and Velcro. Your child also has a waist belt that goes through the cover and attaches to the actual infant seat. The cover can be used for both shopping carts and high chairs. Unfortunately, the cover is not large enough to fit on some of those larger carts in warehouse stores. The cover comes in two different color options. There is just a little padding for your little one. The front of the cover has two fabric loops to attach toys or pacifiers. The front of the cover also has a see-through cover for cell phones so your little one can watch a film during your shopping trip. The back of the cover has two mini pockets. The cover folds up into a bag for transportation between uses. The cover is completely waterproof. There is a pocket for your cell phone. There are loops for toys or other attachments. The cover folds up into a carry bag. This cover is a higher price with medium to lesser quality. There are lots of Velcro, which makes it difficult to attach. The cover is not easy to fold up compactly for storage. The cover does not fit larger carts. EN Babies’ cart cover’s main selling point is the waterproofing of their cover, as this is not a common feature for many of the other covers. The cover itself is neither the best quality nor the worst, but it sells in the higher price range. For the same cost, you are able to purchase much better covers. The Brica GoShop baby shopping cart cover is a cover made by the Munchkin brand name. The cover is both comfortable and practical. The cover is versatile enough to be used for both shopping carts and for high chairs. It is also made stretchy enough to fit most carts, except for the largest warehouse store carts. In those cases, the cover can be used to cover the half of the seat that your child is sitting on. The cover attaches mostly with elastic all around. The back of the cover has a plastic locking system to attach it to the cart seat. The child has a waist strap to keep them inside the cart. The entire cover is machine washable. The cover has two fabric loops to attach toys or pacifiers. There is also a clear cell phone pocket to hold your cell phone while your child watches a movie. There is padding in the high chair for added comfort for your little one. The cover has two toy loops. There is a cell phone pocket on the cover. The cover folds up into a compact bag. The cover is more expensive. There is nothing holding the sides down except elastic, which can cause the cover to scoot around. While this cover can fit many larger carts, it does have trouble fitting over a few of the warehouse carts. There are no storage pockets in the cover. The Brica shopping cart cover is a higher-end cover at a higher price. Along with the price does come better quality than some of the other shopping cart covers. While it is great quality, it is also bulky and heavy. The lack of Velcro or other straps in addition to the elastic can also make using the cover more of a hassle than it is worth. 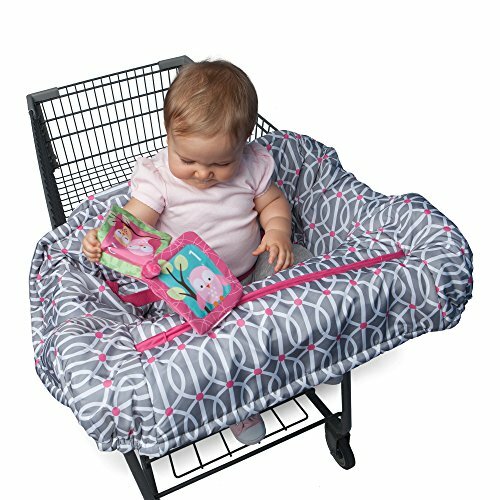 The Boppy shopping cart and high chair cover is a large cover that will fit most carts and high chairs. It also has a little extra padding to keep your little one comfortable while riding along during your shopping trips. Boppy has made many comfortable pillows and supports for you and your little one. Their shopping cart cover tries to offer what comfort they are known for as well. 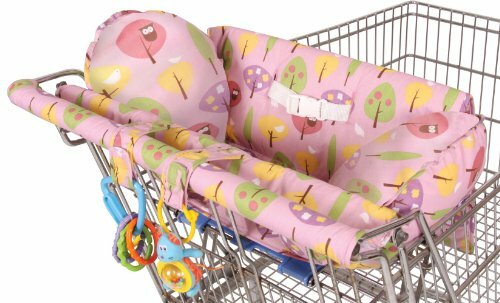 The Boppy shopping cart cover buckles to the cart seat to keep the cover attached to the shopping car. The rest of the cover lies over the cart like a large blanket. There is no elastic siding. It is made large enough to fit many of the larger carts. The backing of the cover is the smallest part of the cover and will not fit over some of the largest carts. Your child has a waist seatbelt attached to the cover to keep them secure. The Boppy shopping cart cover does not have very many features. There are no extra pockets or loops for toys. What they do have is their unique slide line system. This is a line of fabric along which an attached toy can slide. The cover comes with a crinkle book toy attached already on the slide line. This toy can be replaced if you would rather use a different toy on the slide line. The cover is made from polyester, so it is easy to wipe down. It can also be machine washed. The cover has a slide ring for toys. The cover comes with a crinkle toy. The cover is easy to wipe down. The sides of the cover are not elasticized, which causes them to be pulled off much easier. There are no extra storage pockets. The cover does not fold up into a tote or purse. The cover fits most carts, but the back of the cover has trouble with some of the largest warehouse store carts. 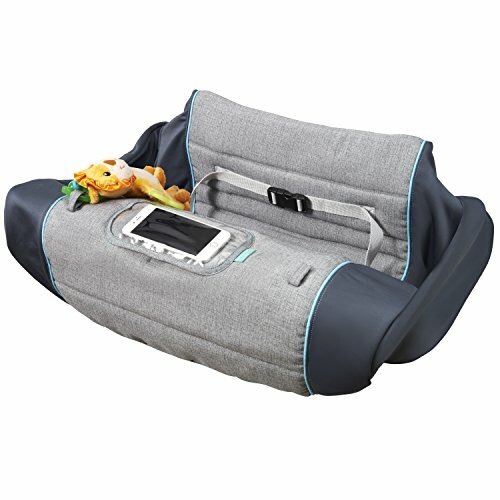 Boppy has made another high-quality product in their line of products. Their cover is functional and comfortable. It can also fit more carts than many of the other covers. Despite this, the cover is lacking in features such as extra pockets and loopholes for toys to keep your little one entertained. The biggest issue with this cover, though, is the lack of elastic siding to keep the cover attached while your child is moving about in the infant seat. 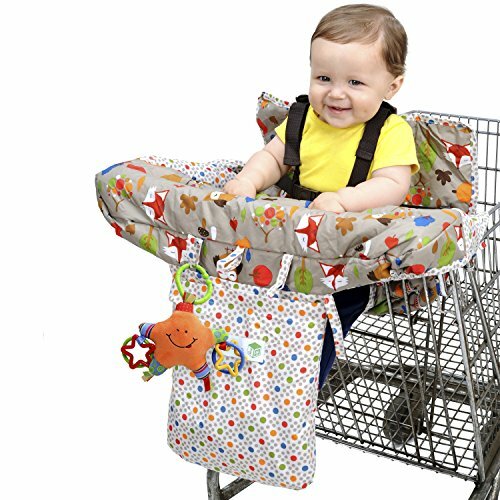 The Jeep 2-in-1 shopping cart cover high chair cover is both very simple to use and one of the safer shopping cart cover options. This is a smaller cover, but as a result, it will not scoot around as much as the larger covers made to fit all carts. Even though it is smaller, it can still work for both carts and high chairs that are smaller. The Jeep cart cover is made very soft with just enough cushioning to add a little comfort but without making the cover bulky. The cover attaches easily as it is made with elastic edges that stretch over the entire cart seat. The back then buckles on to the infant seat. The sides of the cover have strings so that it can be additionally secured around the edges. Your child is held in place by a 5-point harness. The cover has three fabric toy loops for attaching any items your child may need. The cover also has a large pouch on the front of the cover for additional items or for you to keep your own belongings like your phone and keys. This pouch is also the pouch that the entire cover folds into when you are ready to transport it. The cover is able to be wiped down between uses or completely cleaned in the washing machine. The cover has a 5-point harness for extra security. There is an extra large pouch for storage and for folding the cover into. There are toy rings for additional items for your child. The cover is very small and does not even fit on some regular carts. The cover uses string ties instead of Velcro. Jeep has created a great cover with most of the features that a mother would be looking for in a shopping cart cover. The extra large storage pouch, as well as the 5-point harness, are two additional features that make this cover stand out from the rest. The major downfall of this cover is the very limited number of carts it will actually fit on. The Skip Hop compact 2-in-1 high chair and shopping cart cover is one of the most compact covers when it comes to storage. This is mainly due to how the cover has hardly any extra features or even padding in order to reduce size. As a result, the entire cover can fold up into a tiny, built-in pouch. The pouch has an open ring that can then, in turn, be attached to the diaper bag, purse, or any other item to easily carry around without taking up any room inside of bags. The cover is another elastic fitted sheet type of cover. It stretches over the cart seat. There are just two adjustable straps to deal with. The first wraps around the back of the cart and keep the cover attached to the cart. The second is the waist strap that keeps your child safely nestled in the cover. The entire cover is made out of polyester which makes it easy to wipe down between uses. The cover is also machine washable for a more thorough cleaning. The cover fits both shopping carts and high chairs. There are no extra loops, pockets, or other features on the cover. The cover folds up very compactly and can be attached to the outside of any bag. The cover is very simple to attach. The material is very slippy and will slip off nearly all carts. The cover does not fit the larger carts of most of the warehouse stores. There are no toy loops or storage pockets. This Skip Hop cover is one of the more affordable options with decent quality. There are hardly any extra features on this cover, which is both a pro when it comes to storage and con when it comes to convenience. It is also not very secure when on the cart, as babies can slip all around on the excess fabric. That being said, it is one of the easiest and most compact covers to carry with you. 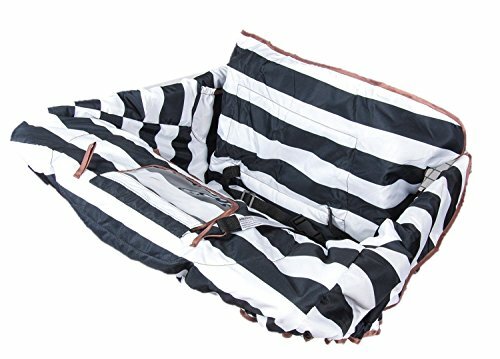 The Summer Infant 2-in-1 cushy cart cover and seat positioner is a cover that adds a little more support for younger infants who are just starting to sit up on their own. The cover comes in two parts. The first is the actual seat cover that will protect your little one from germs. The second part is the support pillow that can be removed as your child grows older and no longer needs the extra support. The cover attaches with elastic all the way around like a fitted sheet. A waist strap going through the cover attaches to the cart and comes back through to hold your child to the cart itself for extra security. The support pillow can also be added for additional support for younger children learning to sit. The cover has two loops for attaching toys or pacifiers so your little one won’t throw them on the floor during your shopping trip. There is also a clear pocket for your phone to allow you to see it if you are reading your shopping list, or to play a video for your child to watch while you shop to keep them entertained. The entire cover is made from polyester which is both easy to wipe down between uses and to wash completely in the washing machine. The cover can be folded into a pouch for storage. The cover has a pocket for a cell phone. There are extra loops for toys and other items. Younger infants can have additional support with the support pillow. The cover is fairly easy to attach. It fits most carts, even larger warehouse carts. The cover is a more expensive cover option. The pillow provides very little support. The pillow is not made very well and comes apart easily in the wash. The cover is very bulky when folded up. 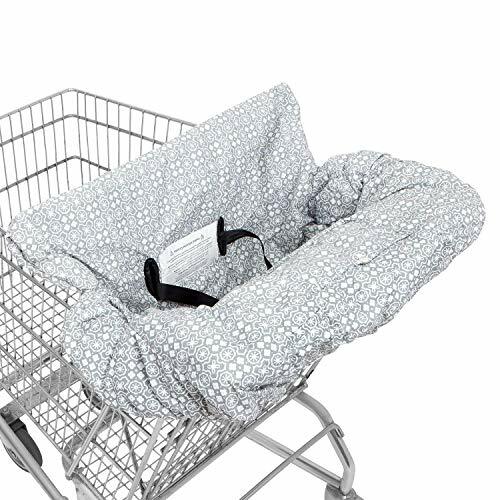 The Summer Infant cart cover offers a great deal by including a support pillow with the cover. In this way, as long as your child can sit on their own, they can sit with a little extra support even during that time when they’re still a little unstable when sitting. Just be sure your child can at least hold their head up on their own, otherwise, they should be in a child carrier that provides the necessary head support. If you like the extra support, just be aware of the extra bulk that will come along with this cover, making it one of the most inconvenient covers to tote around. The Crocnfrog 2-in-1 shopping cart cover has you covered for wherever you may shop. They offer two different shopping covers: medium and large. In this way, they are able to eliminate the extra fabric that universal shopping cart covers have. The medium cover will fit most small to average shopping carts. The large cover will fit medium to large shopping carts, including those large carts found at warehouse stores. The medium cover fits comfortably in the seat, with a little padding to keep your little one comfortable as well. The cover is made from 100% cotton, which is not easy to wipe down but is more comfortable than the usual polyester that most covers have. The cover has two buckles. The one goes around your little one’s waist, the other goes around the cart itself. Ties are available on the sides to keep the cover securely fastened to the cart. The seat has a storage bag on the back. This bag is the same bag that the entire cover will fold into when not in use. It then becomes a tote that is easy to carry on its own or stash in a larger bag. The cover itself has three loops to attach toys or other accessories for your little one to play with. A bottle strap is also available to keep your little one from tossing their bottle on the ground. The larger cover has many of the same features. Instead of folding into a tote, the larger cover folds into a pouch. The larger cover also offers the additional feature of a clear pocket for cell phones. The cover is available in two different sizes. There are loops for toys and other items. The cover folds up into a tote for easy storing. The cover is difficult to attach to the cart securely. The seams come undone after only a few washes. There is very little cushioning. The Crocnfrog shopping cart cover’s greatest attribute is how it comes in two different sizes. Instead of trying to fit a tiny cover over a large cart, or dealing with the excess fabric of a large cover on a small cart, you can purchase the size of cover you need for your store of choice. While the customization is great, the quality is slightly lacking, especially in the padding and stitching. Before deciding on a shopping cart cover, first, try to figure out which stores you frequent and double check that the cover will fit your store’s carts. That will limit which of the covers you will then need to choose from. To decide on the best cover is to find the perfect balance between portability and functionality. The most portable covers have very few features, the covers with the most features and padding are very bulky. The one seat cover that falls right in the middle of bulk and features, so that it has enough features to make your life easier without adding too much extra bulk, is the Infantino compact cart cover. It is easy to use, decently comfortable for your little one and has pockets and straps for all those extra items. Just be sure to wash the cover gently as it is thinner material and not as strong of stitching as some of the others. 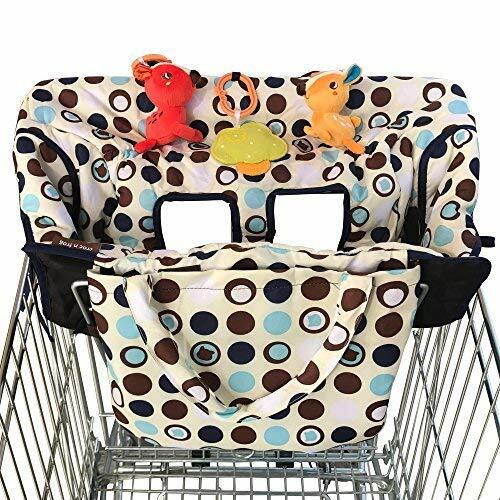 All in all, it is one of the best shopping cart covers for babies.